Runny yet rich Potato Curry along with the crisp stuffed Poori, Bedmi Poori Aur Aloo ki Sabzi combination is nothing but bliss. 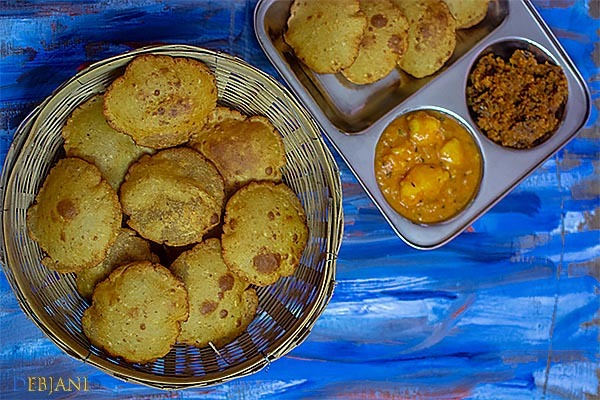 If you are in Uttar Pradesh and especially in Mathura or Agra or Banaras and want to indulge yourself with something spicy and special to that region then according to me the best option is nothing but Bedmi Poori Aur Aloo ki Sabzi. I just love those Bedmi Poories along with the runny Potato Sabzi served. The Aloo ki Sabzi served with Poori in the northern part of the country is completely different from what we get in Bengal. Well, typical poori is altogether different than our luchi after all. 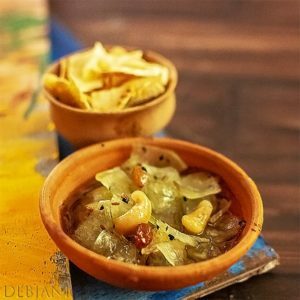 However, the aloo ki sabzi, is prepared with limited spices and has its own unique flavor which indeed is amazing and so is the entire combo Bedmi Poori Aur Aloo ki Sabzi. 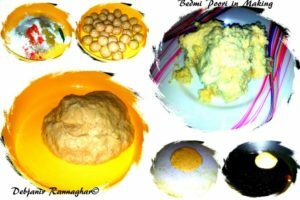 Though the basic ingredient of Bedmi pooris (which is Kalai er Daal or Urad Daal)is same as that of Hing er Kachori, the famous Bengali Kachori, however, taste-wise both are completely different. Both the version are equally delicious. This applies to the side dish served with Poori and kachori. 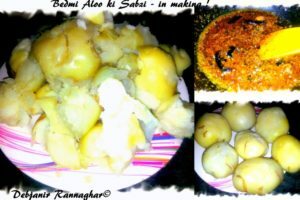 Bedmi poori is mostly served with Bedmi Aloo ki Sabzi which is a no onion no garlic super tasty potato dish. 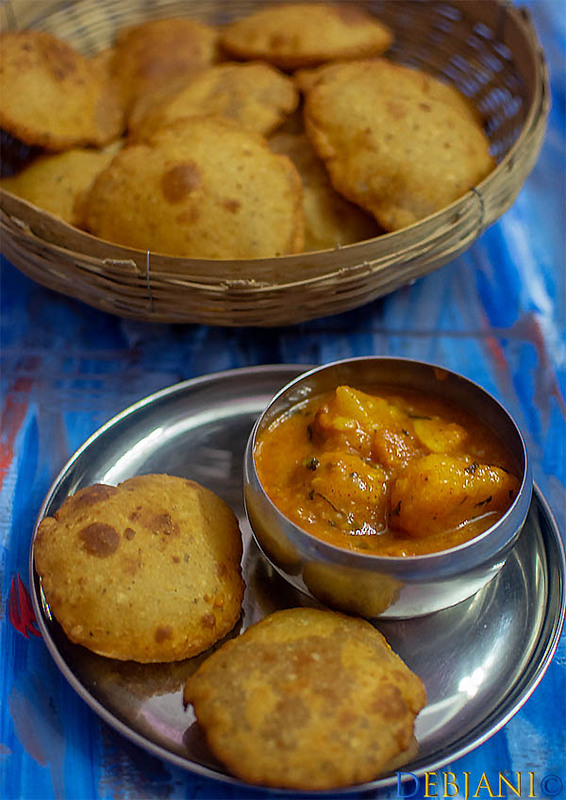 There are two types of Bedmi Poori available; one variety is stuffed with Daal and another variety is not staffed but the dough itself is prepared by mixing Daal and Flour. I am sharing the recipe for the later version this time. What I have noticed when they make the Bedmi Poori aur Aloo ki Sabzi at home they opt for making the dough mixing the Dal mostly with the flour. However, the roadside scenario is different. You can find both the versions in roadside shops. Personally speaking, I prefer the Bedmi poori prepared by mixing the Dal with the flour instead of stuffing it. Here’s how I make Bedmi Poori aur Aloo Ki Sabzi at Debjanir Rannaghar! Fennel Seed / Mouri / Saunf Powder: 1 Tbsp. Dry Mango Powder/ Aaamchoor Powder: ½ tsp. Coriander/ Dhane / Dhaniya Powder: 1 Tsp. Coriander / Dhane / Dhaniya Powder: 1 Tsp. Dried Fenugreek Leaves / Kasuri Methi: 1 tsp. Clarified Butter / Ghee: 1 Tbsp. Soak Kalai / Urad Daal in water for 4-6 hours or preferably overnight and make a coarse paste of the soaked Daal along with green chillies. Try to use almost no water to make the paste. In a bowl mix flour with Fennel Seed Powder, Asafoetida, Dry Ginger Powder, Red Chilli Powder, Aaamchoor Powder, Coriander Powder and salt . Now add Daal paste to the flour mixture and start kneading and if required add very little water to make a semi-soft dough. Add Ghee to the dough and again knead for a minute or so. Now cover the dough with a wait cloth and give it a rest of 20 minutes. Knead the dough one more time and divide it into 15 equal sized balls. Take a ball and start rolling into a 5” circle and fry it on medium flame to get a golden Poori. Don't fry Poori on high flame. Following the process mentioned fry all the Poories. Boil potatoes with little salt and drain the water from the pan. Don't cut the Potatoes into cube like we usually do while making a Potato dish instead break potatoes with the help of the back side of a spatula/ ladle to get uneven pieces and some Mashed Potatoes. This dish is specified by the texture of the potatoes. In pan heat ghee and oil and temper the ghee-oil mixture with dried Red chilies, Asafoetida and Cumin seeds. Now add dried Fenugreek leaves and cook for 1 minute in medium flame. Then add Tomato puree and ginger paste and cook for 2-3 minutes. Add Cumin powder, Coriander powder, Turmeric powder, Red Chili powder, and salt and then cook for another 2-3 minute or until oil comes from the mixture. Add potatoes and mix with the spices well and then add 3 cups of water to the mixture. In half a cup of water add 1 tbsp. of wheat flour and mix properly and then add this mixture to the potato gravy. This step is optional but provides a good texture to the gravy. Boil the Sabzi till you get the desired consistency; however, it’s preferred to be a bit runny. 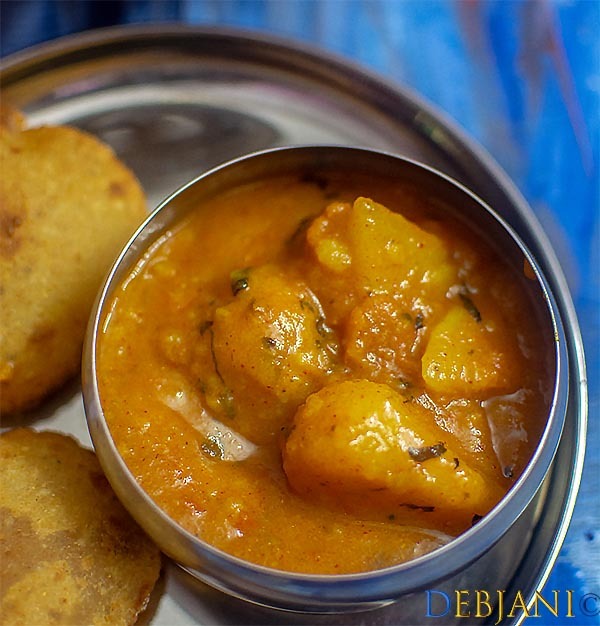 Have you tried the Bedmi Poori aur Aloo Ki Sabzi recipe from Debjanir Rannaghar!